Knowing the limitations of string inverters may tell you just why the Module Level Power Electronics segment – microinverters – is on the rise. Microinverters or string? PV system designers fall into two camps, some favoring big inverters and others moving toward the powerful little boxes that meet each module where the real action is: on the roof. A PV array only works as well as the lowest-performing module. That means intermittent shading from trees, flagpoles – even fallen leaves – can cripple a string of modules as even minor shadows pass across the array throughout the day. By offering independent, module-level inversion, a microinverter installation can outperform a conventional string array by up 20 percent. You’ll get the most out of every module, every hour of the day. A string inverter that’s right-sized for an array today may be too small if you want to add more modules tomorrow. That means buying a bigger inverter, too. Ouch. Microinverters are the forward-thinking choice, letting you add on to your array at any time, easily and cost effectively. Startup costs of a string system might be lower on a per-watt basis, but what you save up front, you’ll lose over time in lower performance. The key metric of Levelized Cost of Energy – that is, system cost measured over its lifetime – favors microinverters. The microinverters start generating power at lower light levels than string inverters, so the power curve raises and peaks earlier in the day and extends further into the afternoon and evening. Thanks to module-level inversion at these lower light levels, microinverters enjoy a superior output and higher rate of energy production. Every module in a string adds more to the DC current flowing across the rooftop – quite a volt load by the time it reaches a inverter, up to 1,000 volts DC. Not very safe for installers or emergency responders who may have to cross the roof. Microinverters take the jolts out of the volts. Module-level inversion means only low-voltage DC in each circuit, keeping you safe over the life of the system. String inverters still have their niche, but module-level power inversion is tomorrow’s technology today. A leading analytics firm recently noted that sales of microinverters and related products should top 2 gigwatts by year’s end, and predicts the microinverters’ share of the larger MLPE market could triple by 2018. That’s a product with a bright future. Still not convinced? Hear what solar professionals have to say at our APsystems video channel on YouTube. 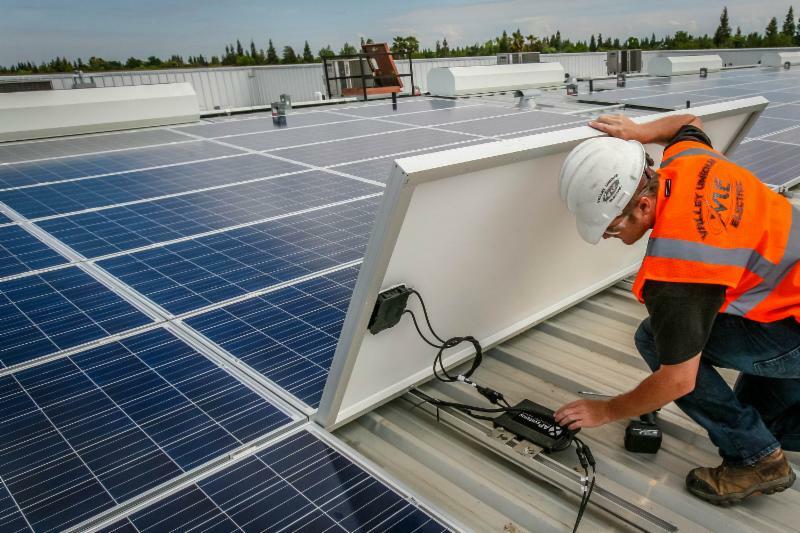 Find out why installers choose APsystems microninverter technology over conventional string systems, and then put module-level power to work in your next PV project. For best performance, the power rating of modules must be matched to that of the string inverter that serves them. Yet these inverters offer a narrow range of power ratings that may not correspond to the cumulative output of the array. You may be buying more inverter than you really need. Module-level inversion lets you to match inverters to modules throughout the array. Pay for the inversion power you need to get the job done – and no more.